Configure and verify eBGP between two autonomous systems. In this activity, you will configure and verify the operation of eBGP between autonomous systems 65001 and 65002. ACME Inc. is a company that has a partnership with Other Company and must exchange routes. Both companies have their own autonomous systems and will use ISP as the transit AS to reach each other. Note: Only companies with very large networks can afford their own autonomous system. Step 1: Configure eBGP in ACME Inc.
ACME Inc. hired an ISP to connect to a partner company called Other Company. The ISP has established network reachability within its network and to Other Company. You must connect ACME to the ISP so that ACME and Other Company can communicate. Because ISP is using BGP as the routing protocol, you must configure ACME1, ACME’s border router, to establish a BGP neighbor connection with ISP1, the ISP border router that faces ACME. a. Verify that the ISP has provided IP reachability through its network by pinging 1.1.1.9, the IP address assigned to ISP2’s Serial 0/0/0. b. From any device inside ACME’s network, ping the Other Company’s server 172.16.10.2. The pings should fail as no BGP routing is configured at this time. c. Configure ACME1 to become an eBGP peer with ISP1. ACME’s AS number is 65001, while the ISP is using AS number 65003. Use the 1.1.1.1 as the neighbor IP address and make sure to add ACME’s internal network 192.168.0.0/24 to BGP. From any device inside ACME’s network, ping the Other Company internal server again. Does it work? Step 2: Configure eBGP in Other Company Inc. The network administrator at Other Company is not familiar with BGP and could not configure their side of the link. You must also configure their end of the connection. 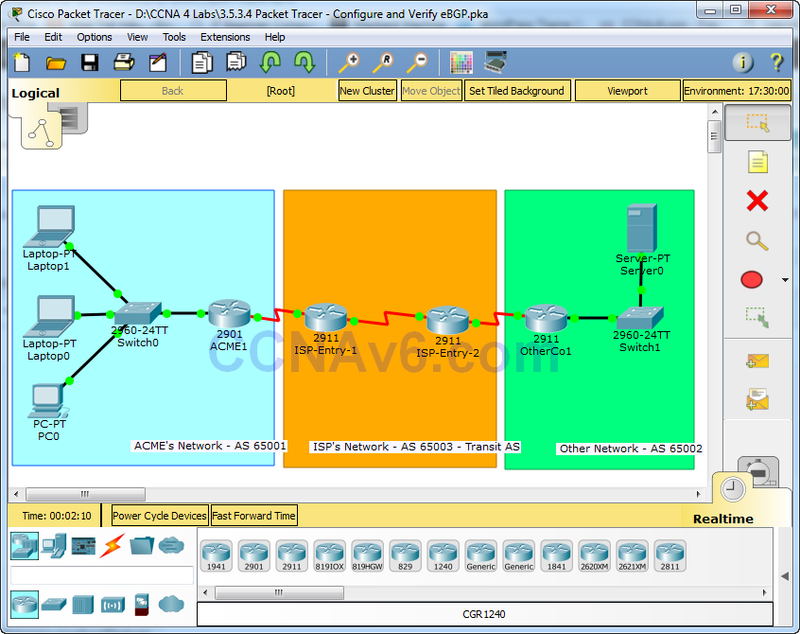 Configure OtherCo1 to form an eBGP adjacency with ISP2, the ISP border router facing OtherCo1. Other Company is under AS 65002 while ISP is under AS 65003. Use the 1.1.1.9 as the neighbor IP address of ISP2 and make sure to add Other Company’s internal network 172.16.10.0/24 to BGP. a. Verify that ACME1 has properly formed an eBGP adjacency with ISP1. 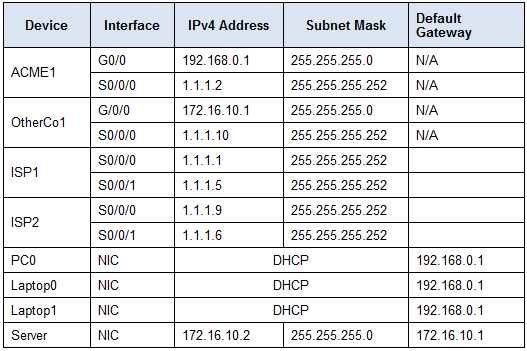 The show ip bgp summary command is very useful here. b. Use the show ip bgp summary command to verify all the routes ACME1 has learned via eBGP and their status. c. Look at the routing tables on ACME1 and OtherCo1. ACME1 should have routes learned about Other Company’s route 172.16.10.0/24. Similarly, OtherCo1 should now know about ACME’s route 192.168.0.0/24. e. From any ACME Inc. device, ping the Other Company’s server at 172.16.10.2.